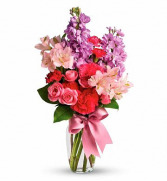 Pink Spray Roses, Light Pink Alstroemeria, Hot Pink Carnations, Lavender Stock, Assorted Lush Greenery And More. 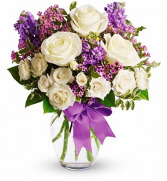 Simply lovely flowers all wrapped up into one pretty bouquet. A thoughtful choice for any special occasion in Fort Worth. 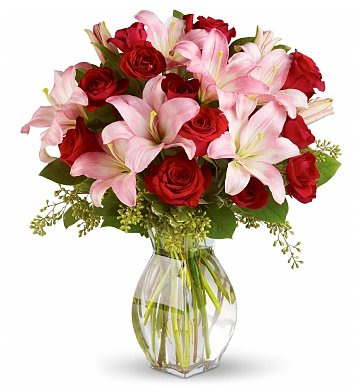 Spray Roses, Pink Asiatic Lilies, White Alstroemeria, Pink Matsumoto Asters, Seeded Eucalyptus, Leatherleaf Fern, Dusty Miller, And Pitta Negra. 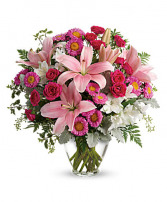 This pretty unique hot pink bouquet, a sure way to make your special someone's day in Fort Worth!